MOST ex-pros see the D-League as a jumping point back to the PBA. Eric Salamat is no different. Now playing for new D-League team Flying V, Salamat said he hasn't given up on his dream to make it back to the PBA, feeling he still has some unfinished business to take care of. "Syempre gusto kong bumalik sa PBA," said Salamat, the 13th overall pick by Alaska in the 2011 PBA rookie draft. "Kasi para sa akin, unfinished business ko yun e."
The former Ateneo guard played in 27 games with the Aces and Air21 in the pro league during the 2011-2012 season but saw his career derailed by an ACL injury. He was never the same after coming back, playing in only a few more games with Air21 and Talk 'N Text (now TNT KaTropa) over the next two years before dropping out entirely. That now serves as his motivation as he aspires for a PBA comeback at age 29. "Kahit nakarating ako sa PBA, nawala e kasi nagka-ACL ako," said Salamat, who won three championships with the Blue Eagles from 2008 to 2010 under coach Norman Black. "Hirap ng transition kasi almost one year ako nag-sit out tapos pag balik ko nag-expire contract ko. So di ko na na-prove yung Eric Salamat na fresh out of college," he added. 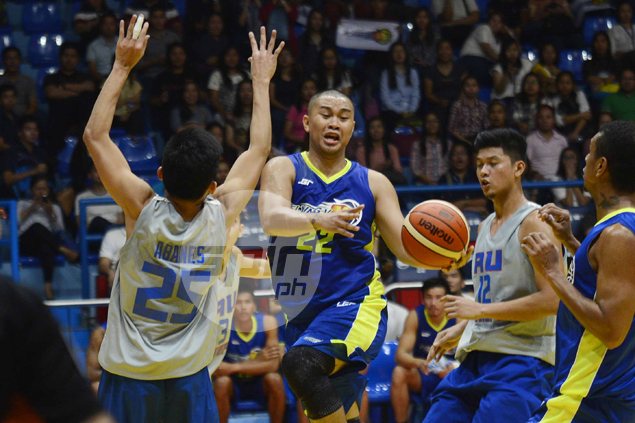 Salamat is now trying to prove himself all over again at Flying V, giving a good account of himself in a tuneup game against Arellano University at the Filoil Flying V Arena on Friday. Salamat finished with 13 points on top of three rebounds, eight assists, and four steals, but his team settled for a draw against the Kent Salado-led Chiefs. While he was glad with how the game panned out, Salamat said there is more room for improvement for a team that also parades fellow former pros Paolo Hubalde, Joshua Webb, Gab Banal, and Hans Thiele. "Since new team kami di pa ganun ka-jell yung team namin compared sa mga college teams, so para sakin happy na ako sa nangyari sa team namin ngayon," he said. "Pero marami pa rin pwedeng ma-improve."